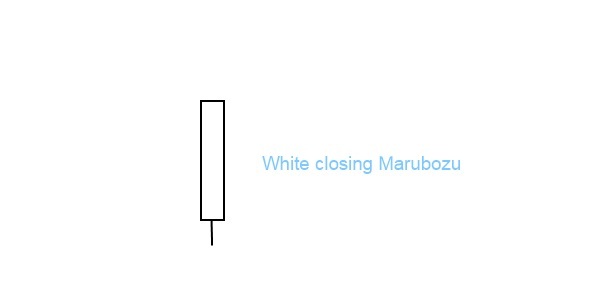 The white closing marubozu is a single candlestick pattern characterized by a long white body with no upper shadow. This is an extremely strong bullish candlestick pattern. The day opens the prices then slightly fall, creating the lower shadow. Then stocks continue to go up all day, the highest price is the closing one, therefore there is no upper shadow. Hence the bulls were very strong during the day except the initial phase of the trading. What does a white closing marubozu show? The white closing marubozu is a single candlestick pattern with low reliability. It only reflects one day’s trading and it may show the continuation of the trend but it may also indicate reversal. Depending on its appearance on the chart and how the lower shadow looks, it may predict a continuation of a trend or indicate its reversal.